The NX-8 panel comes standard with eight hardwire zone inputs. Four programmable outputs can be set up to activate external devices during an alarm or other system event. The modular design allows for complete integration of multiple systems within one enclosure. Adding more zones or expanding capability is fast and easy. With a NetworX security system from BAP Security, you have peace of mind that your home or business is equipped with the most advanced and reliable security technology available. 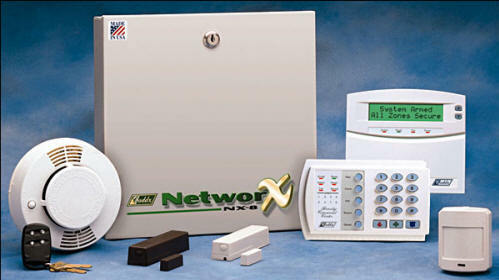 NetworX systems are proven in applications from single family homes to commercial buildings with multiple businesses. They have specially designed keypads that make using advanced security technology simple. For your peace of mind, trust the brand security professionals know and trust – NetworX by GE Security. The specially designed NetworX keypad is the control for your security system. The keypad enables users to activate the system in either a ‘STAY’ or ‘ARMED’ mode. In ‘STAY’ mode, only the perimeter sensors (i.e., door and window contacts) are turned on while the interior motion sensors are turned off. This allows freedom of movement within the home or business being protected. When no one will be at the location being secured, the system should be ‘ARMED’. In this state, all the sensors are turned on and the system is able to provide maximum protection. NetworX systems have a time delay for entry and exit which allows you to leave and re-enter the building without setting off an alarm when the system is ARMED.